One of the most entertaining activities on the 1MWW public Facebook page is voting for the cover for the upcoming month. I create at least two potential Facebook page covers and ask fans to vote for their favorite. The photos I use are ones I’ve taken in years past, but they all correspond with the month they represent. I decided to broaden the monthly decision making by posting the choices here as well. Once you’ve chosen your favorite, jump on over to 1MWW on Facebook and vote. And while you’re there, LIKE our page! Here’s the two contenders for March, 2019. The first is a photo I took in March, 2014 of a late snow, which stunned just about everyone, including this redbud tree. The second photo was taken in March, 2013 on a Sunday drive through the country south of Nashville. In a beautiful twist of fate, this same drive with this view is one I take frequently as my horse is boarded at a barn just down the road. There’s the back story on these two photos—the rest is up to you! Thanks for voting. One of my great pleasures as the founder of One Million Women Walking is interviewing walking women. By sharing our stories we connect and inspire other women; it’s the, “Wow, if she can do it, I can do it,” response. I love that! Sharing these stories is one of the foundational pieces of the 1MWW movement. We become a community when we share our stories and know one another’s challenges and transformations. And we build a walking consciousness around that community. That’s important because . . . Walking is not an “it” athletic activity. Walking hasn’t been commercially sexualized like yoga and Pilates and hot boxing. Walking is frequently dismissed as “not real exercise” because it’s free, doable, not grueling and it doesn’t require special equipment. So walking is the underdog of the workout world yet it deserves its place in the sun and its benefits need to be sung loud, proud, and often. Hence the Walking Women interviews here on Solvitur Ambulando. This quick post is to invite you to read my last three interviews. Read the interview then buy the book and in the book, read Rachel’s interview with me! Earlier this month I interviewed Walking Woman and 1MWW Member Peggy Hubbard, who was losing her sense of Self prior to taking up walking. Her story will move you, inspire you, and make you reflect on what you’re really doing for Self-care. 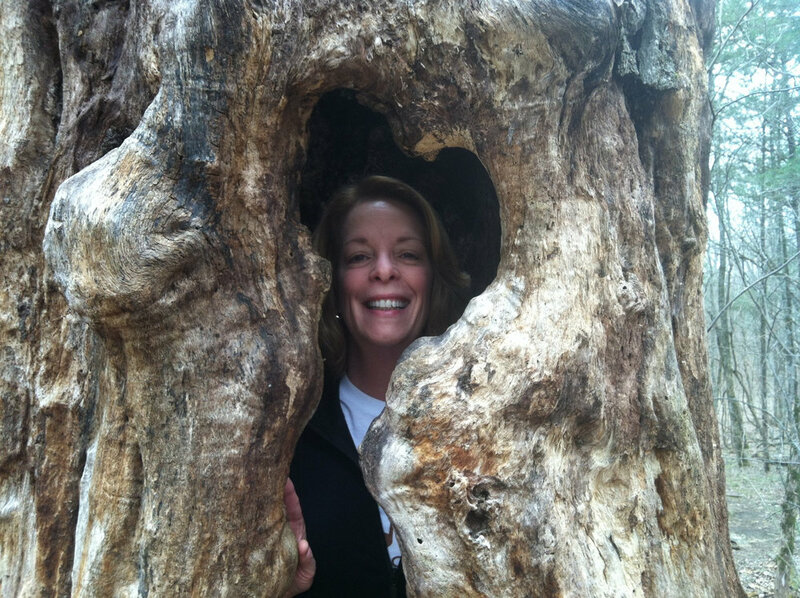 This is Peggy being hugged by a hollow tree shaped like a heart. February is heart health month. The synchronicity of this makes me smile. Happy Heart Health Month Peggy! Just before February, aka Heart Health Month, I wrapped up January with an interview of my friend, 1MWW Member and brilliant artist Karla Deal. Karla was unable to walk for years due to chronic pain. Read her story and you’ll never take walking for granted again. Here’s Karla in her studio! Visit her at Copper is My Canvas to have your mind blown by the beauty this lady creates! These three ladies—an artist and passionate dog owner, an insurance agent with a new hip, an author and mom with three boys—all have stories that inspire, that we can relate to, that we discover a bit of ourselves in when we read them. In that recognition a connection is born, an inspiration flares up, a sense of possibility comes to the surface. Follow those feelings with action. Join 1MWW and start transforming your life today. 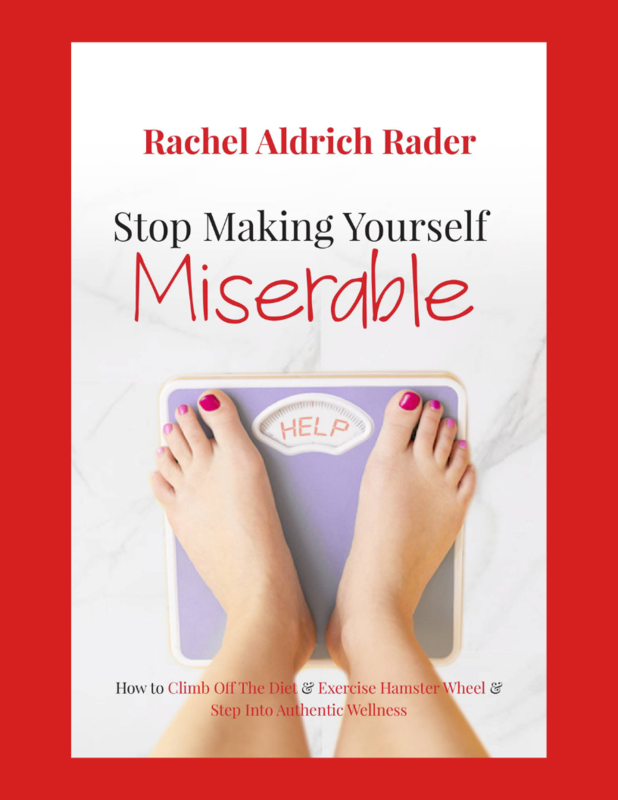 In honor of this special day, allow me to introduce Rachel Aldrich Rader, author of the just released, Stop Making Yourself Miserable, How to Climb off the Diet and Exercise Hamster Wheel and Step Into Authentic Wellness. I’m especially thrilled to be bringing this interview to you on Valentine’s Day because Rachel is all about Self-love and Self-care and how these are the absolute starting point to authentic wellness. Welcome Rachel and her timely message! Q. Rachel, I love the title of your book. Where did it come from? A. I am glad that you love it because coming up with the title was the hardest part of writing the book for me! I spent 7 years working as a personal trainer in gyms, studios and people’s homes. Most of my clients were women. They were different in many ways but the one thing that everyone had in common was that they were unhappy with their body in some way and hoped that a good fitness routine would be the thing that finally clicked for them. It made me realize the subtle messages that women receive from our culture. We have this vague notion that our bodies aren’t quite right and we need to fix them. We do that with some combination of diet and exercise and when we don’t see the results that we think we want, we change that combination a bit and try again. Over and over and over again. The result is that we’re stuck in this cycle of thinking “I just have to get it right, this time it will work!” In the meantime, we remain unhappy in our bodies convinced that the problem is us trying to force ourselves through diets and fitness plans that are not authentic. I wanted to wave my arms, jump up and down and yell “Stop!” There is so much noise out there in the fitness and wellness world. Women spend a tremendous amount of energy on trying to change their bodies. And most of the time, it doesn’t make them happy! My message is all about noticing the patterns that we are stuck in and intentionally opting out. Q. There truly is so much noise out there—I completely agree. To that point, you let us know right off the bat that we’ve been lied to and worse, that we’ve bought into the lies. What are the lies that are really aggravating you these days? A. One big misconception is that fitness or wellness has to look a certain way. That it has to look like a fitness routine and a diet. Generally when a woman feels unhappy with her body, she’ll start thinking about one or the other. Or if she already has those things as part of her life, she’ll try to tweak one or the other to make it just right. Again, getting stuck in the cycle of looking for “The Answer” in one of these places. What happens is that she adds to her stress and takes away from her wellbeing. The truth is that wellness is individual. “The Answer” looks different for everyone. This leads to another misconception. That is that if something works for one person, it will work for someone else. We are so connected with each other through social media. It is an easy trap to see what someone else is up to and think, “Oh, she looks great, I should do what she’s doing,” without considering that her lifestyle, her body, her goal is completely different. Any habit that you set out to create has to be in line with who you are, not based on someone else’s life. Another major myth is that diet and exercise are the big pillars of a healthy lifestyle. And if you find yourself believing this one, you’re not alone and it’s not your fault! Weight loss is a 60 billion dollar industry. Just think about that. This is an industry based on convincing you that your body is wrong and you need to fix it - and they have just the product or plan to help you out! It’s easy to see how we have come to believe that if our body looks a certain way and we’d like it look different, we just need a new diet or workout. The truth is that of course nutrition and movement matter, but they are only two pieces of a big puzzle that, again, looks different for everyone. Stress plays a huge role on how the body’s systems work. Sleep makes a difference. How you monitor your thoughts and manage your emotions matters. It’s worth taking the time to look into all of the things that affect your health. You are a whole person, you’re not just your calorie count or your workout schedule. Q. Rachel, you’re so clear about addressing the whole person, the whole self on a very personal journey to health and wellness. What are your specific steps for us to stop making ourselves miserable? A. The first is to take a realistic look at where you are now. What types of messages are you internalizing from outside sources and from your own thoughts? Is your inner monologue empowering or discouraging? Next is to sift through those thoughts and weed out which are the messages that you’re receiving from this weight-obsessed culture and which are your own voice. This sounds easier than it really is! When you’ve been internalizing these message for years, or decades, it takes a bit of introspection to decide what you really, truly want for yourself. With that internal guidance, it’s then possible to create an authentic goal or vision for your life and your health and decide what you’re going to do to get there. Setting the strategy involves looking back on what you’ve done in the past and pinpointing which elements have worked well and which haven’t. It all requires being very, very honest with yourself and recognizing that you really are the boss. It’s not your trainer or your friend or even your doctor. You are the one with the power to unapologetically live this lifestyle that you want, and it really has to be what YOU want. Oftentimes, women are stuck in “shoulds”. It takes a little bit of time to be really real. Don’t rush and don’t give up on whatever it is that you truly desire for your life. Know that things will not work out perfectly, they never do, and that’s ok. There will be times when you’ll have to regroup or even completely change your plans and neither of those things equal failure. Q. Rachel, your message and your method are so inspiring and so hopeful! What’s your hope for your readers? A. My hope is that my readers will feel empowered. A lot of women go through life with this vague notion that whatever they are doing in terms of fitness and wellness is wrong. They are pretty sure that they know what they’re supposed to do, what they’re expected to do, but they just can’t quite get it together enough to get it done and reach this magical place where all is well and they are at peace with their body. The message of my book is to take notice of that thought pattern, to stop it from continuing and to build the lifestyle that brings them joy. Q. Rachel your book needs to be in the heads, hearts, and hands of every woman in this country--where can we get a copy? A. The book is available at Amazon and Barnes & Noble. Rachel, I can’t thank you enough for sharing your wisdom and caring with us on this Valentine’s Day. Your book is a loving gift to give ourselves and I’m so grateful you wrote it! Thank you! Rachel Aldrich Rader is a Wellness Coach, ACSM Certified Personal Trainer and a former perfectionist. She is a lover of Mexican food, red wine and crime novels, and is grateful for a career where yoga pants and sneakers are considered professional. Rachel lives in New England with her husband, three boys and one judgemental cat. Follow Rachel on Instagram or Facebook, or join her fabulous Facebook group, Wellness Over Weight Loss! Today’s Walking Women interview is with Peggy Hubbard of Lewisburg, Tennessee. Q. Peggy, what inspired you to start walking? A. Several years ago I was working a full time job and caring for a disabled husband. Each day melted into the next and I was losing my identity to my roles in life: business owner, caregiver, volunteer. One way to squeeze out some private time was to wake very early before the day’s caregiving duties began. One morning the sun was out and spring had arrived to Middle Tennessee. So, I leashed my beloved dog, Pepper, and we took off walking up a country road that led to our home. I discovered sights, smells and sounds I had not noticed from the car. I knew I had to give myself this gift over and over again. A habit was born! Q. How long have you been walking? A. I’ve walked/hiked consistently for 6 years. Q. What changes have resulted from walking? A. Naturally my body changed as my legs and lungs became stronger. My soul opened to the joy of a sunrise, the smells of fresh hay, and the sounds of nature waking for a new day. I found joy in the baby goats at a nearby farm and took time to stop and watch their prancing and playing. I happily waited for the neighbor’s horse to exit the barn and head to the fence to greet Pepper with a quick snort. So, patience, a badly needed trait, was gained. The sound of my feet and Pepper’s paws hitting the ground became nearly hypnotic as I thanked God for all His goodness and grace. Q. What happens if you don’t walk? A. Recently having a hip replacement has helped me understand how central walking is to my life. After a couple of weeks of being unable to move much I became stiff and unable to sleep well. Now that I can once again walk I’m limber, feel stronger and sleeping better. Mentally I find that walking keeps me grounded and causes me to take the time to practice gratitude which keeps me in tune with my blessings - which are many. Q. What does walking mean to you? A. Walking is so much more than getting from one place to another. It’s the opportunity to take in nature. It’s the opportunity to find the path less traveled and saunter down while taking in the delicious sights, smells and sounds. Q. What are your biggest walking challenges/obstacles? A. Like most people, time and weather are often challenges. But now that I get the senior discount at our well equipped Rec Center I have many options for rainy day walking and the hours give me a safe place to walk after dark. Sometimes my heart wants to tackle trails longer and steeper than my body desires! Q. What advice would you give to women who know they should be walking but aren’t - yet? A. Take it one block at a time. Start by perhaps thinking of things that bring your life joy and voice gratitude for them. Use the time to experience your own breath, the feel of your body moving and the sounds of your feet connecting with Earth. Peggy, thank you so very much for sharing your walking story with us. You’re an inspiration in every way! Peggy Hubbard is a State Farm Insurance Agent. She maintains an office in Lewisburg, TN and conducts business throughout the state. She is also an adjunct instructor of Criminal Justice at Columbia State Community College, a Rotarian currently serving as an Assistant District Governor, a volunteer for several charitable organizations, a lover of nature, and a member of One Million Women Walking! Peggy is married to the marvelous Paul Kingsbury who is her frequent hiking partner, travel companion and all-around best friend. They have two adored kitty cats, Libby and Lizzy. Peggy loves music of all kinds, reading both fiction and non-fiction, and exploring nature. Peggy’s passion is using her skills and talents to help others be their very best. She loves to be surrounded by positive, happy friends and believes in a hands-on approach to charitable work. Today’s Walking Women Interview is with Karla Deal of Nashville, Tennessee. Q. Karla, what inspired you to start walking? A. Mostly, my dog. He requires daily exercise, like myself. ☺ But due to my chronic pelvic pain, I was unable to walk him for years. We had to default to dog parks, where he could run and I could watch from the sidelines. Not the life I wanted but had to learn new skills to find ways to exercise with the pain. Since that has become more manageable, my walking has taken on a whole new meaning. And my feet taking me to new places that I can photograph. Photography is a huge passion for me and I see so many photo ops while out walking. A. More consistently, about 2 years now. Q. What changes (body, mind, spirit) have resulted from walking? A. My body is much more mobile, my mind is a lot less cluttered and my spirit feels much more connected, especially to nature. I love nature and it fills my soul to be out in it. My level of gratitude has also increased since my body is allowing me to get out and walk. Walking was something I completely took for granted, until I was unable to do it for 15 years. Now I get out and walk as much as I can because…….I can. In my case, it’s a privilege that I absolutely no longer take for granted. A. I think I start feeling depressed and sluggish. You know what they say—”A body at rest stays at rest and a body in motion, stays in motion”! My body craves the movement. A. FREEDOM!! Just for the fact that I can now incorporate it into my life. And it is a part of all I do on a daily basis to bring my Body/Mind/Spirit into alignment. Walking is now an integral part of my overall healing and it is very healing for me to walk. And it’s my way of being able to connect with nature in an uncomplicated way. No reservations are required. No walking partner is required. Just pick a place and Maverick and I are off and walking. In addition to all of the mentioned benefits, it allows Maverick and I an opportunity to bond even more. A. Finding trails that allow Maverick to walk with me. I prefer ground trails to asphalt, as I like feeling the connection of my feet to the earth. The heat and humidity here in the South can also be challenging. My body has apparently never adjusted to this heat and humidity, even though I have lived here my entire life. Q. What advice would you give to women who know they should be walking but aren’t—yet? A. Walking is healing. Nature is healing. And both create alignment for your Body/Mind/Spirit. Give yourself the gift of healing and connection and start walking. You will discover new things about yourself and the world you live in. Karla, we must be Soul Sisters! Thank you so much for sharing your walking story with 1MWW! Karla Deal is a Copper Artisan and owner of Copper is My Canvas, where she creates gorgeous custom copper for both residential and commercial clients. She is also a student of Buddhism and a lover of life. Most importantly, Karla is Mother to Maverick, her 7 yr. old rescued Standard Poodle, who lives the good life! “My BFF,” says Karla. Karla is a lover of all animals, nature, photography, sunrises and sunsets, walking, hiking, exploring, traveling, art, waterfalls, theater and volunteering with rescued horses. Her Self-Care practices include daily meditation, walking, hiking, Pilates, swimming, restorative yoga, silent meditation retreats, breath work and dharma talks. Karla is also a member of 1MWW. Karla’s passion is working with copper and surrounding herself with people and teachers she can learn from. I was asked this excellent question by an audience member at a speaking event last year. My response? I feel better every time I walk. It’s that simple and yes, that self-serving. I like feeling better. I really like being able to get up and do something, on my own volition, that makes a significant difference in how I feel: physically, mentally, and spiritually. That’s the beauty of walking. Walking makes you feel better right away. This has been proven by countless researchers in a variety of areas. Walking boosts self-esteem and mood, resets your metabolism, refreshes your thinking, and renews your spirit. You can make yourself feel better by walking. You can chose walking every day as a way to feel better. And who doesn’t want to feel better? Because feeling better, is better. FEEL BETTER TODAY. GO FOR A WALK. Download my free e-book, The Truth About Women Walking, to learn more about how and why walking transforms your life. Join the 1MWW movement on Patreon. Hire me to speak at your next event! Form a 1MWW Chapter at work, for your bookclub, for your professional group, for your women’s church group! Contact me and I’ll share the simple 1MWW Chapter Guidelines with you. Note: All members of your Chapter must be members of 1MWW on Patreon. Walking literally saved my life during my darkest years. That experience was the pebble in the pond that led me to founding the 1MWW movement—my first crazy idea. Now, as we enter a new year—2019—1MWW and I are on to the next chapter where my second crazy idea is being realized. Crazy idea #1: To inspire and empower 1,000,000 women to transform their lives by walking. An audacious goal and the mission of one million women walking. Which in turn leads to . . .
Crazy idea #2: By creating the biggest virtual community of walking women on the planet. The topic of this post. Crazy idea #2 rose up from my deep belief in women’s connectivity and caring—our unique feminine superpowers. When women deliberately connect to learn, experience, support, and share, we create community and transform ourSelves and our lives. That’s powerful. In fact there’s exponential power to be harnessed here! Harnessing that power became the next step in my journey. I knew that combining women’s superpowers with the 1MWW mission would create an amazing women’s health movement and community—an ever expanding group of virtual walking partners. But where would we be located? How would we do it? What would it look like? Last spring I was visiting Minnesota where I had lived for 25+ years. One of the great joys in going back is connecting with my old friends and getting caught up. Frequently this takes place on walks because we all love walking! To create the biggest global community of walking women on the planet. I could lead the movement. I could share the 1MWW 3-Step Walking Practice. Women could become members of the movement. Members could connect with one another and get ongoing support from me—as needed. I could get feedback from members on what was working, what wasn’t, and what they needed. Members could share where they’re walking and how the 1MWW Practice is transforming their lives. Members could invite their BFF’s, co-workers, sisters, aunts, daughters, mothers, neighbors etc to join the movement. We could collectively establish 1MWW Chapters for members to walk together IRL. As we were walking, my friend told me about Patreon, an easy membership site I had never heard of. To cut to the chase: that’s where we are! Patreon is the virtual home of the 1MWW movement. Membership is $1/month. Thanks to a good walk with a good friend, the 1MWW movement now has a home where walking women can align with the 1MWW idea, take action, and transform their health and their lives. I’ve said it before, and I’ll say it again many times, walking works! Connect with me if you have questions about Patreon, 1MWW, or speaking to your group. Ponder that and then consider that Fortune Magazine recently named Diamandis one of the World’s 50 Greatest Leaders. His quote is one of my favorites and is also my guiding light. You see, I have this crazy idea . . .
To inspire and empower 1,000, 000 women to transform their lives by simply walking. Where did my “crazy idea” come from? It came from the darkest time in my life. It came from years of struggling with identity, loss of dreams, loss of financial stability, loss of my home, loss of family. It came from the fact that during those horrible years, walking saved my life. In fact I credit walking (over 3,000 miles all told) with not only saving my life, but with transforming my life! A key piece in my transformation was learning how and why walking is such a powerful activity. Once I began to truly understand the full picture of what walking does, I started sharing what I’d learned with every single woman I could. I was absolutely called to spread the word about walking because walking is truly the magic pill we’ve all been searching for. To be more exact, walking is actually women’s multi-tasking miracle! Walking solves so many problems unique to women. Lifestyle Problems like not having enough time to workout even when we want to and know we need to! Health Problems like heart disease, bone loss, dementia. Mental problems like depression, anxiety, brain fog and trouble making decisions. Emotional problems like feeling isolated, wanting connection, needing community and support. Spiritual problems like craving a time and space for peace and yearning for a true sense of Self. True Self-care, meaningful Self-care, healing Self-care is what walking provides for women. In speaking with women about their health and Self-care I learned that many women feel woefully underserved by and estranged from the health and wellness marketplace. The products and services clogging the market are ridden with shaming messages—both words and images. When I spoke with women about their health and Self-care the need they expressed had a common theme: women want a highly effective, meaningful, time and cost friendly way to workout that fits their unique lifestyle and life-stage. That’s what walking does—more than any other form of exercise. Walking is the ultimate way to care for ourselves every day. Because I know walking increases creativity by 60% and that walking is a proven problem solver, I took my question for a walk and my crazy idea came to me! To inspire and empower 1,000,000 women to transform their lives by simply walking. Become a member of the 1MWW movement! Leave a comment below with your crazy ideas! Top Three Benefits of Winter Walking for Women! I lived in Minnesota and Wisconsin for 25+ years so I know a thing or two about winter walking. In my last blog post I reviewed how good gear and the right route make winter walking truly wonderful. In today’s post I highlight my top 3 benefits of winter walking for women. Combat SAD! Seasonal Affective Disorder is more common in women than men and, having suffered from it myself, I am particularly sensitive to how devastating it can be. Walking is a fantastic way to combat SAD because of the exposure to sunlight, which in turn helps us produce much needed vitamin D. Some studies suggest that a Vitamin D deficiency might be an underlying cause of SAD. Just 15 minutes of sun on your face and hands 2 or 3 times per week means getting enough sun for vitamin D production. This sun exposure triggers vitamin D production in the skin, which helps combat SAD. And ladies here’s a great side-benefit of winter walking/vitamin D production—our bones need vitamin D to make our bodies absorb the calcium we need to keep our bones strong. Burn more calories! I’m not a huge proponent of calorie counting but I am a proponent of being aware of what you eat and why. I’m also very aware that in winter it’s easy to eat more carbs and sweets and exercise less. That’s why winter walking is a great exercise choice. We burn more calories because our bodies are working harder to stay warm. Win-win? I think so! Boost self-esteem! Studies have shown that outdoor exercise can boost self-esteem. When we feel good about ourselves, we make better choices for ourselves. In this way boosting self-esteem becomes a self-fulfilling prophecy. Self-esteem is defined as, “Confidence in one’s own worth or abilities; self-respect.” This is something I want for all women—that we feel confident in who we are and we care for who we are! Deliberately boosting our self-esteem with a winter walk seems like a very natural self-care choice! Winter walking has benefits for your whole Self—that’s body, mind, and spirit—that will help you get through winter with a joy and resilience you’ve never experienced before. I highly recommend you get your walk on this winter to be happy, healthy, and to have a spring in your step no matter the season. Join 1MWW on Patreon for the inspiration, empowerment, community, connection, and accountability you need to transform your life by simply walking. I can’t wait to walk with you! Winter walking can be truly wonderful given the right gear and the right route. I lived in Minnesota for over 25 years so I know of what I speak! Here’s my winter walking guidelines for good gear and the right routes. Good gear isn’t necessarily expensive or super high tech. To me good gear is gear that fits well and does the job you need done. For winter walking you need gear that holds your body heat comfortably and also breathes. I recommend a “grounds up” approach starting with what you’ll put on your feet. If the snow cover is fairly light (less than 3 or 4 inches) well insulated hiking boots and wool socks will keep your toes toasty for your 25-minute brisk walk. Layer on some long underwear and wind pants or jeans to keep your legs warm and for your torso take the same approach— a long underwear top and a fleece or wool sweater. I like an insulated but light weight coat to cover my core; the main thing I want is wind protection. My final good gear suggestions are mittens or gloves, a neck gaiter and a good warm hat. There you go—you’re ready to walk! The right route is one that’s easily accessible, safe, and beautiful. Easy access for some of us is right out the door, which is ideal. If your neighborhood is walkable, you can’t beat “out-the-door” for time management! If your right route is not in your immediate neighborhood, make sure it’s well-lit, has little to no ice, is well trafficked by fellow walkers, and is easy to get to so that you will indeed get there on a regular basis. My main right route criteria is no ice—one slip on a hidden patch of ice and your winter walk turns into a winter spill. Avoid this by walking routes that have full sun during the day and are walked frequently. Keep it simple, easy and doable walking women and you’ll fall in love with wonderful winter walking. P.S. Through the One Million Women Walking movement, I help you get the exercise you want in just minutes per day so your Self-care and your TO DO list both get handled! Join 1MWW on Patreon for $1/month to get the exercise you want, the accountability, support, motivation and encouragement you need, and the life transformation you yearn for! See you there—I can’t wait to walk with you!